Can we recycle our old Samsung SCX-4216 toner cartridges through you? Cartridge Save are industry-leading suppliers of bargain Samsung SCX-4216 laser toner cartridges based in Great Britain. You can't go wrong with our company when it comes to cheap Samsung toners. When buying with Cartridge Save, you never have to use time searching local shops for the Samsung supplies your printer requires. Find the most competitive bargains online with us. You can be assured of complete peace of mind when you place an order for brand new Samsung SCX4216 toner from Cartridge Save because of the extensive thirty day cash back policy. You should bear in mind that each order comes with absolutely free delivery, which generally arrives at the address on the next day! Small offices looking for a multifunction printer that is compact and affordable will have great use for the Samsung SCX-4216 MFP. This monochrome laser printer can print, scan, and copy, with maximum resolutions up to 2400 dpi when using the colour scan option. The Samsung SCX-4216 laser printer offers exceptional quality, though it falls behind when it comes to speed, printing at a rate of 17 ppm. It offers versatile paper handling, though it is only built for small to mid-volume print tasks. Built for desktop operation, the Samsung SCX-4216 multifunction printer does away with the extra bulk by offering only the basic multifunction features. It has an automatic document feeder, a duplexer, and standard paper trays with input capacities up to 250 sheets. While the input capacity is not as large, it is fairly generous, considering the unit is only built for low to mid volume printing. The Samsung SCX-4216 printer weighs only 28 pounds, making it easier to transport when needed. 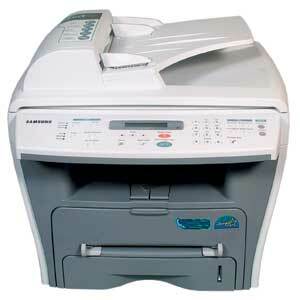 Ideal for office workgroups, the Samsung SCX4216 mono laser printer offers affordable operation. It features toner save and eco mode functions in addition to its energy saving design. The ADF unit makes document handling easier, while the software suite includes optical character recognition which converts scanned text into editable and searchable text. Print quality is also impressive, producing clear and sharp text. Savings on original Samsung SCX-4216 toner can be made by purchasing two cartridges at once in a black twin pack. One disadvantage of the Samsung SCX 4216 printer is its lack of colour printing features, though the scanner can process coloured images. Print rates are slow but good enough for small office use.